Runners from all over the world participate to support a ban on the manufacture and inhumane use of anti-personnel mines. Entry fees and additional financial support foster independence among landmine victims by helping provide prosthetic limbs, social reintegration programs, and supporting other relevant and needed programs such as education and prevention of any serious new diseases in Cambodia . Another important part of charity also goes to the support Poor Children in hospitals such as Angkor Children Hospital and Kantha Bopha Children Hospital. Organizers: National Olympic Committee of Cambodia (NOCC), Association of Athletics Federation of Cambodia (Khmer AAF), Cambodian Events Organizer Co., Ltd (CEO). Sanction by: Association of International Marathon and Road Races (AIMS).Association of Khmer Athletics Federation of Cambodia (KAAF). 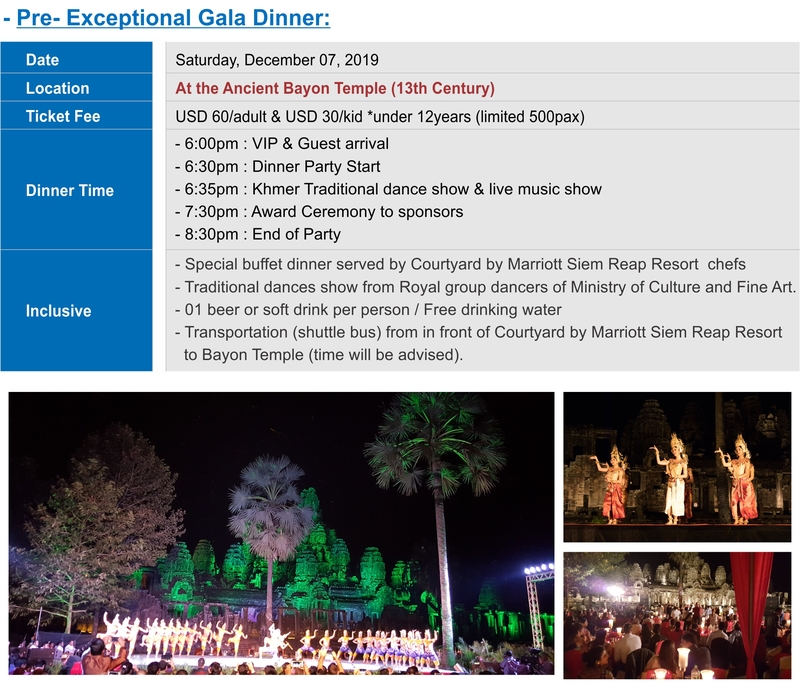 The Royal Government of Kingdom of Cambodia, Siem Reap province Governmental Authority , Ministry of Tourism, Ministry of Education Youth and Sports, Ministry of Culture and Fine Arts, Apsara Authority, Embassy of the Kingdom of Cambodia in Japan, Embassy of Japan in the Kingdom of Cambodia. Cambodia consulate in Osaka, Association of Athletics Federations Asia, Japan Association of Athletics Federations, international organizations, ASEAN-Japan Centre, Japan International Cooperation Agency, Tokyo Office, United Nations Population Fund, Cambodian Red Cross, Cambodia Trust, Mine Action Japan, Japan to Ban Landmines campaign, Sankei Shimbun, Sankei Sports, Nippon Broadcasting System, Inc., Sanyo newspaper, San’yohoso, Okayamahoso. Kausumigaura Marathon…. Start / Finish Location: In front of Angkor Wat Temple, Siem Reap, Cambodia. From the Siem Reap town to the Angkor Wat temple (start point) around 6km .It takes 20 minutes by Motor Remorque (Tuk Tuk) and 15minutes by Taxi or Bus. 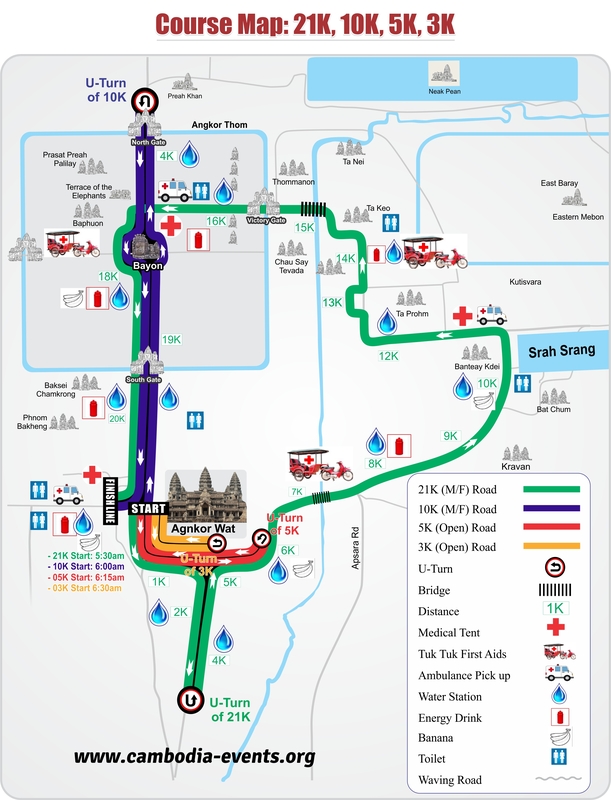 All participants of Angkor Wat International Half Marathon must arrive the event place in front of the Angkor Wat at least 30minutes before the starting time. AWHM committee will provide Finisher-Medal for 21km, 10km & 5Km for completed runners at Finishing area, and Running Certificate for 3km completed runners after the race. Free Foods & drinks will be served at the Finish Area. - Every 2km points ,the water station is set up for delivering water and electrolyte drinks to all runners. Some water stations also serve banana together with drinks. - Check points for the Bib tag timing was set up near Angkor Wat and Angkor Thom area. - Every distance of 1Km on the running course will be marked by a sign board on the right side of the road. The time record will be posted in the Cambodia Events Organizer website 1 day after the event. Angkor Wat International Half Marathon is flat course with ancient tree along the course. There are around 14 ancient temples along the course. The runners can enjoy to take photos during running. It is unique course inside the world heritage area. If you couldn’t come to pick up your race pack during final confirmation date, you should make a letter attached with your confirmation sheet pass it to your relation so they could pick up instead of you. * Race Participants should read, understand, and sign up the waiver clause in the registration form. The registration after the deadline 01 November will not be accepted. >> Click Here to watch Angkor Wat International Half Marathon race course preview. Our International Races are certified by AIMS and sanctioned by IAAF, please select your corresponding category in the registration platform. No. 79 C, St. 155, Sangkat Toul Tompong I, Khan Chamkamorn, Phnom Penh, Cambodia. (#0609, Road No.6A, Phum Chongkoesou, Khum Slor Kram, Siem Reap, Cambodia. Notice: All expatriate participants should go to representative office of AWHM Committee registration office (PNH & REP) to fill in application form and direct payment. The completed form of group list would be send us before 25 October 2019. All participants in the group should read, understand and sign up the waiver clause in the registration forms. Finisher‘s Certificate for 3Km Fun Run. Winner medals for top three overall. Half Marathon (21Km), 10Km Road Race and 5Km participants will use the timing Bib tag. On 01 November 2019 at 17:00 (Cambodia Time). Online-registration will not accepted for late participants after deadline. Onsite registration is based on our availability with limited spaces. Exhibition for Race Packs pick up: Conference Hall of Courtyard by Marriott Siem Reap Resort. From: 5th to 7th December 2019. - Entry fees exclude VAT. - For runners who could not register the race through our online network by unexpected case and insist on registering directly to us, those will be registered immediately upon we have received the payment in our bank account and please send us the bank slip of payment after you transferred it. - The bank charges incurred by transfer must be paid by the participants. Entry fees are net and not deducted from amount remitted (The runner must cover both service fee). - Entry is non-transferable to another competitor. - Entry is non-transferable to next year's competition or other events. - Make sure that you have read and understand and accept the waiver clause and Race Rules..
- Every runner will get ID pass from Marathon Committee on the date of race pack collection at Courtyard by Marriott Siem Reap Resort in Siem Reap from 05-07 December 2019. This ID Pass will be permitted for free entrance to Angkor Area to check the running course on 06-07 December 2019, but not allowed to go inside the temples. If you would like to visit inside the Angkor Ruins, applicants have an obligation to pay Angkor Entrance fee as $37 for 1day at the check point of Apsara Authority. ** All booking fees of Course Inspection and Dinner Party couldn't refund. ==> The Gala Dinner price is only for runners who participate to the event. If other clients would like to join, price will be surcharge US$ 10 per person. Donors will definitely receive the thank you letter from the Marathon Committee. As the main purpose of our events is charity events, we are trying the best contribution to the cause of building a better future for young generation of Cambodia through physical education of sport events and financial supports to poor children in the hospitals, disable people of landmines. Within the period of more than 22 years we have been working with some charitable NGOs to support their projects and also support to Angkor children hospital, Cambodian Red Cross, Kantha Bopha Children’s Hospital, Cambodian Trust, Handicap International Belgium, Cambodia disable athletic federation , Kruasa Thmey, Mekong du Enfants … Therefore one part of your participation fee will certainly go to the charity account and especially any of your big or small donation will bring an important benefit to the people in need. Each event, we have its platform for your kind donation through online or on-site. Thank you so much for your kind concern to participate in supporting our charitable target. Your donation will be shown in our website of each event and also a thank you letter from the Organizing Committee will be delivered to you. Cambodia Events Organizer (c)2016 . All Rights Reserved.